Henry Cavill Is On The Justice League Set, But What Could That Mean? SPOILER WARNING: The following article contains massive spoilers for Zack Snyder’s Batman v Superman: Dawn of Justice. If you have not yet seen the film, and don’t wish for any details to be revealed before you do, please click away to another one of our wonderful articles! Things don’t end too well for the Man of Steel at the end of Zack Snyder’s Batman v Superman: Dawn of Justice. Just after he starts getting along with some of his superhero brethren in the Dark Knight and Wonder Woman, he winds up sacrificing himself and dying while killing Doomsday. Of course, we all knew that Henry Cavill’s character would eventually be coming back, as there isn’t a great deal of sense in launching a DC Cinematic Universe without Superman, but it seems that his resurrection might be happening incredibly fast. How do we know that? Because we just watched footage from the set of the first Justice League film that had Cavill standing right beside a handful of his co-stars and director. On Tuesday afternoon, attendees at CinemaCon – the annual convention in Las Vegas held for theaters – were given the opportunity to watch Warner Bros. run down their entire slate of titles coming out in the next year and beyond. This kicked off with a presentation about the upcoming slate of DC Comics movies, including a sizzle reel of trailer footage from Suicide Squad, but the most intriguing bit came in the form of a video that was shown recorded on the set of Justice League. 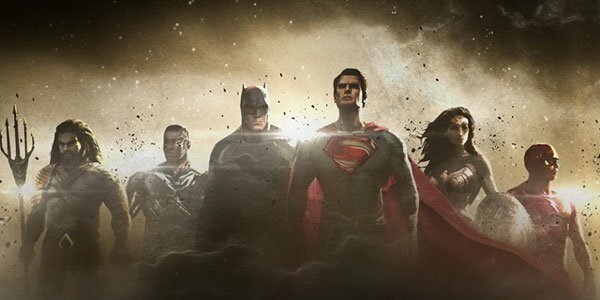 It was just a quick hello from director Zack Snyder, thanking those in distribution for their support of Batman v Superman: Dawn of Justice, but he was surrounded by most of the main cast of Justice League - including (out of costume) Ezra Miller, Ray Fisher, Gal Gadot, Jason Momoa, and Henry Cavill. It’s true that it’s possible that Cavill is actually playing a corpse for most of the 2017 blockbuster, but the recorded evidence definitely seems to suggest that Superman will quickly be back amongst the living. As noted earlier, we never really expected that the legendary Kryptonian would be gone all that long – with levitating dirt in the last shot of Batman v Superman: Dawn of Justice driving home that the story isn’t over – but this seems rather quick. It’s true that when Superman died in the comics he was brought back about one year later (discovered not to be totally dead, but in a deep, coma-like state and in need of yellow sun rays), but this certainly seems like a quick turnaround in the cinematic world. There are already many movie-goers that complained the Man of Steel’s death occurred too early in the budding franchise, the event, as a result, not packing the emotional weight that it should, and resurrecting him too quickly could result in similar backlash for Justice League. What do you think Henry Cavill being spotted on the Justice League set means? How do you think Superman will eventually be brought back to life? Hit the comments section below with your thoughts.